Between 8% and 11% of patients who undergo open reduction and internal fixation (ORIF) for a hip fracture are subsequently converted to a total hip arthroplasty (THA) due to complications of the screw fixation. Conversion from ORIF to THA is a more demanding, technically difficult procedure than an elective primary THA, but it is one that orthopaedic surgeons may need to perform more frequently in the next 20 years as the US population ages and becomes more vulnerable to hip fracture. At the meeting, Essential Hip Topics: Cradle to Grave, Ronald E. Delanois, MD, from The Rubin Institute for Advanced Orthopedics in Baltimore, Maryland, shared the rules he follows to improve outcomes in hip fracture patients who are converted to THA. Keep comorbidities in mind. Identify and optimize patients’ comorbidities, such as diabetes mellitus and dementia, to improve the quality of care and reduce readmissions. Consider the fracture pattern. What was the initial fracture type and fixation, and why did this fixation fail? The answers will impact selection of the prosthesis and fixation of the femoral component. Always think infection. Be wary of latent infection: Research has shown that when cultured, 10% of removed hardware is positive for infection, which may be the reason the hardware failed. Make sure patients understand that they may need an antibiotic spacer. Examine the patient. Don’t rely on the radiographic and lab findings to diagnose the patient: Physical examination is imperative and will provide valuable information on range of motion, leg length discrepancy, gait, and abductor strength. It may uncover the reason the patient is experiencing pain and dysfunction and help with preoperative planning and implant selection. Remember to template. Templating provides an opportunity for the surgeon to think through the operation, such as how to manage issues with bone quality and/or deficiency, deformity, and leg length discrepancy – all of which influence the type of cup, stem, and augments that will be needed. Don’t forget the back. Pelvic obliquity is another issue the surgeon should consider. Lumbar rigidity leads to pelvic rigidity, which can cause impingement when the patient sits. This can occur, for example, in patients who have decreased lumbar motion from a lumbar fusion. Pick the prosthesis carefully. Should the patient undergo THA, or would a hemiarthrolasty be a better choice, such as in a low-demand patient with impaired cognition and a high risk for dislocation? If the patient is older and has poor bone quality, would a cemented stem be more appropriate than a press-fit stem? What about the acetabular component? Should the cup be cemented, or is a press-fit cup with supplemental screw fixation acceptable? Always worry about dislocation. This is a major concern following conversion to a THA, so the surgeon should take steps to minimize the risk, such as using a large-diameter head (36 mm) and considering a dual-mobility socket, which recent research has suggested may have an effect on reducing dislocation. Plan ahead to minimize complications. Carefully select the surgical approach, placement of the incision, and the osteotomy, and take steps to prevent intraoperative shaft fracture. Maintain realistic expectations. Make sure the patient knows what to expect: Have a frank discussion of possible complications, such as loosening and dislocation, as well as the chances of reoperation or failure. This may help with the patient’s overall satisfaction with the procedure. 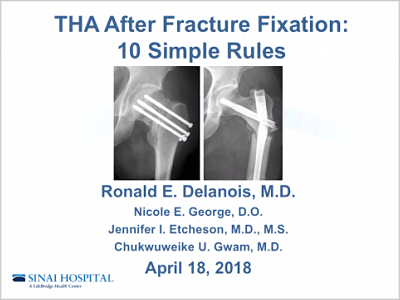 Click the image above to watch the presentation and learn more from Dr. Delanois about THA after fracture fixation. Dr. Delanois has no disclosures relevant to this presentation.